1) Hickory and Maple - "Smoked here on the farm for 3 days...a delightful, smooth cheese. One of our most popular flavors. 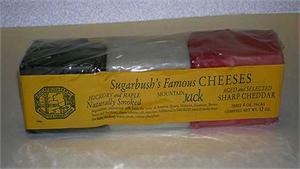 The American Cheese Society First Prize Winner for Best Smoked Cheese in America." taste in cheese...as it's enjoyed by all who taste it"
3) Aged and Selected Sharp Cheddar - "Our youngest sharp cheddar, aged approximately 18 months. A white cheddar with excellent flavor perfect for a moderate sharp cheddar lover. Great for snacks or cooking as it melts well because of its higher moisture content than the extra sharp cheeses. " "Here in Vermont cheese is made the traditional way which provides the best flavor and old fashioned quality. All the cheeses are hand cut and hand wrapped. We hand dip each bar in three coats of special cheese coating wax to lock in the peak flavor and allows for safe shipping and long keeping."